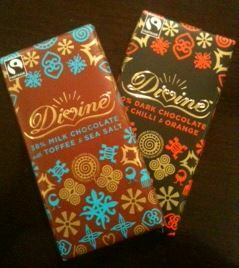 Two brand new flavours are hitting London for Fairtrade Fortnight before hitting our supermarkets and Oxfam shops here in the UK from Divine Chocolate – a 38% milk (very high for Divine) with toffee and sea salt in a delicious 100g bar is one of the new flavours and the other is a dark 70% chili and orange bar. Both of these are brand new and exclusively available at the Divine pop-up shop during Fairtrade fortnight. 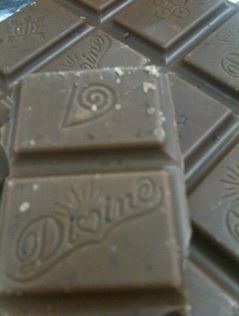 I was given these bars when I went to judge the “Divine Chocolateers” competition. This was all about winning the chance to learn what goes in to making the perfect Divine chocolate bar and also once trained, if they wanted to they could also make money by doing demos around the country. Absolutely fantastic prize with the chance to also start a new part-time career. That day of judging, the very first box of chocolate bars had arrived and I was gifted one of each flavour and each of the semi-finalists also got to try the two new flavours – the first to try them! But what were they like…? 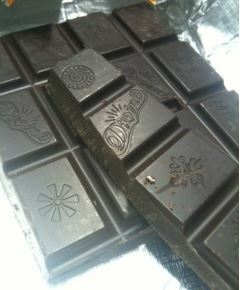 70% Dark Chocolate with Chilli and Orange – This bar is not what you might be expecting. The dark chocolate holds the heat of the chilli but the orange also comes through and because the chilli isn’t too extreme, the orange and chilli balance out well. The chilli does build as you eat more of the bar but not too much, giving a nice warmth but without making you feel like your mouth is on fire. The orange isn’t stt strong so while you get the flavour of an orange chocolate, it isn’t artificial or overpowering. Well balanced flavours. Overall, both these bars are excellent. Great work from farmer-owned chocolate company Divine Chocolate and I hope that if you can’t make it to London for Fairtrade Fortnight that you’ll pick up at least one of these bars in your local supermarket when they go on sale nationwide.